Studies show that a primarily plant based diet can help with a wide variety of health issues, even including chronic diseases. A plant based diet can give you all of the vitamins, minerals, protein, carbohydrates, and everything else you need to maintain the healthiest diet possible. You don’t necessarily have to switch to a completely vegan or vegetarian diet, simply incorporate more vegetables into your daily diet and make them the main focus of each meal. Not only will vegetables be healthier but also you find you need to add less salt because your food will be more flavorful. 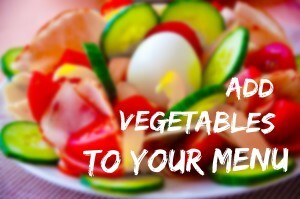 Many people simply do not know how to incorporate more vegetables into their diet. Especially with the Standard American Diet, most people tend to focus on meat and simple carbohydrates for most meals and consider a plant based meal just a salad. Nothing could be further from the truth, however, and most people would be surprised how many delicious ways there are to add more vegetables to your menu. There is nothing simpler, more versatile, and quite as delicious as a good stir-fry. All it takes is a few minutes and your favorite fresh vegetables. You can put pretty much anything you like into a stir-fry. For example, try sugar snap peas, mushrooms, carrot, zucchini, onions, peppers, and broccoli. Simply chop and then sauté the vegetables in a small amount of olive oil or sesame oil and flavor with some low-sodium soy sauce. Serve over rice. Too many Americans, especially those with chronic issues like diabetes and cardiovascular disease, focus too much on simple carbohydrates like pasta. A good way to fill your plate with lots of fresh, healthy vegetables is to literally replace your noodles with veggies. You can use a knife or purchase an inexpensive kitchen tool to make vegetables like zucchini into noodles. Top them with sauce of your choice, and you will be surprised how delicious “almost pasta” can be. They’re good for your heart, literally. Not only that, but they are super versatile. You can incorporate beans into just about any meal. Consider a delicious meal of pinto beans and corn bread baked with corn and diced peppers inside. Or have a big bowl of spicy bean chili. Whether you start with dry or canned beans, they are full of fiber and protein and are super healthy. Just make sure to rinse well if you use canned. Roasted or grilled kabobs are a great dinnertime option for everyone, from kids to picky eaters, and they are a great way to incorporate lots of veggies. They are also super easy to prepare. All you have to do is chop a bunch of any vegetable you can skewer. For a delicious twist, add a few fruits like pineapple chunks, apples, or pears. Simply skewer your veggies and roast or grill to perfection. Serve with rice or on top of a fresh salad. Incorporating more vegetables into your diet is much easier than most people think. You just have to change your way of thinking a little bit. Pretty much everything you can do with meat, you can do with vegetables, so just think of how much you can replace. If you can make your plate mostly plant based and cut down on everything else, you’ll be on your way to a healthy plant based diet. Now you have some ideas on how to add vegetables to your menu, what other ideas do you have? Leave me a comment.